I estimate that I will have 45 minutes between arriving at O'Hare and when my flight leaves. I will have two bags to check in, and I'm on an international flight with EVA Air that leaves at 12:30 AM. Will 45 mins be enough time for me to check my bags, go through security, and board the plane? Question update: What if, in a different scenario, I have 1 hour 30 minutes between arriving at O'Hare and the flight's departure, also with 2 bags to check? Below is a screenshot of the flight I intend to board. 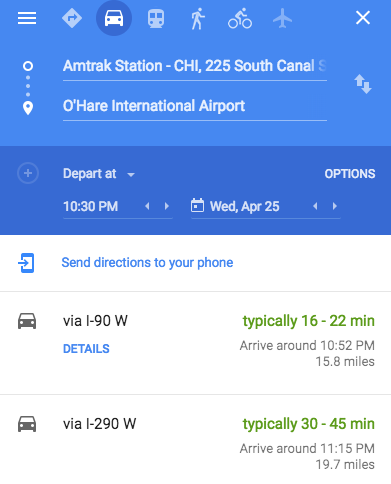 Leave Ann Arbor 6:51pm, arrive at Chicago O'Hare at 10:25pm (see screenshot below) on Amtrak (this is the only transport (coaches considered) that's compatible with my schedule that day). Pre-schedule an Uber to go from Chicago Union Station to O'Hare, taking around 35 mins (also see screenshot below). Hope to get there no later than 11:05 in the worst case scenario. I can have the Uber drive me straight to terminal 5, which is where EVA Air will be. I appreciate all the answers and comments - they've really helped. According to the airline's website, check-in counters at O'Hare are "closed punctually 1 hour before flight departure". Arriving 45 minutes before the scheduled departure will essentially guarantee that you will miss the flight. With a checked bag, I think you have zero chance of making this flight, and this assumes you arrive on your proposed schedule. For an international flight, you should arrive two hours prior to departure - 90 minutes might be okay, but it could be pushing it. You can sometimes be in line for a significant amount of time while you wait to clear security, and it can take a significant amount of time at O'Hare to get to your gate from security. I'd reschedule your flight if you can't arrive at least an hour sooner. The fatal flaw in your plan is less the airplane than the train. Seriously? Amtrak running on time!? And then the Uber, when the train is late, your Uber is gone and you must schedule another one - more time lost! Er hold it... there's also baggage pick-up at Amtrak. Not instantaneous. To say nothing of traffic. "off-hours" doesn't help if there's construction, which they do off-hours. Baggage check-in will close well before the flight, and even gate check-in has a cutoff. Upshot is, you need to plan at least 4 hours (is that even enough?) from CHI to your plane departure. 7 hours if Amtrak is involved. 24 hours if an overnight Amtrak is involved. I don't hate Amtrak: I ride it a lot. It's a great way to travel. You just have to plan for the "late". Edit: Oh dear, you did mean Amtrak! OK, so the Michigan line has 3 trains a day, leaving Ann Arbor (AA or A2) at 7:20a, 12:17p and 6:51p. You have opted for the latest one because you want 6 more hours in AA, and this is what is breaking your plan. Voila: Take the earlier train and you get the 7 hours I was talking about. What you may be missing is downtown Chicago is a fairly wonderful place to spend an evening. When Amtrak surprises you by being on-time, go have fun shopping and eating in downtown. Amtrak may be able to hold your bags while you do that, or go to ORD, check em, and take the Blue Line back. take a shuttle to Detroit DTW airport, and a hopper flight to ORD. That will land you directly at ORD instead of the Uber shuffle, and takes Amtrak right out of the picture, which is a huge win for timekeeping lol. You're still taking your chances with delays and will need some padding. Call up and add the DTW-ORD flight to your ticket, and they will match you up to a flight they're willing to guarantee. Rebook your international flight from DTW instead of ORD. Ex-Chicagoan here, with literally hundreds of flights out of ORD, domestic and international. Once you provide more info I can provide a better answer, but since at the moment you are asking only about the arrival to boarding time I will address that. 90 minutes from when you step into the terminal should be enough but you should consider that you have two large bags and you don't have time to deal with unexpected delays of any type. If after dropping bags you have about 60-70 minutes, than you can make it to the gate. Your flight will have a long boarding procedure and will be likely in T5 (if things have not changed), EVA staff knows you are on your way to the gate, even if security takes you 30 minutes you will reach the gate no problem. Towards the end of check-in there is almost no line, and if EVA allows check-in up to 60 minutes before departure that means you can make it. Other considerations: during the week and late at night security takes less time, the airport is less cluttered because at T5 many flights to Europe will have already left, it looks like your flight will be one of the last. Transportation to ORD (it should be another question): after 9pm there is substantially less traffic around downtown, you might lose some time at the stop lights (there are lots in Chicago), but once you get on the express way you would be cruising. If you change plan and arrive earlier at CHI you might consider at rush hour, or with time to spare, taking the blue line, it will take you straight into the airport terminal (not T5 however), however if your bags are huge and you are alone that might slow you down. The blue line after rush hour will be quiet and I think from downtown is 45 minutes to ORD. Not the answer you're looking for? Browse other questions tagged air-travel trains airports short-connections ord or ask your own question. 1h50m is enough to transfer in Madrid Airport?